Wall-paper has a pretty bad reputation among contemporary house proud decorators, yet it has so much appeal for artists. Being passé and completely decorative is just one of the reason to use it for inspiration. Another wonderful feature is that its broken symmetry and patterning work so well in backgrounds. Additionally, wall-paper is loaded with symbolism, both within its own images and culturally as metaphor for the times it has been popular. 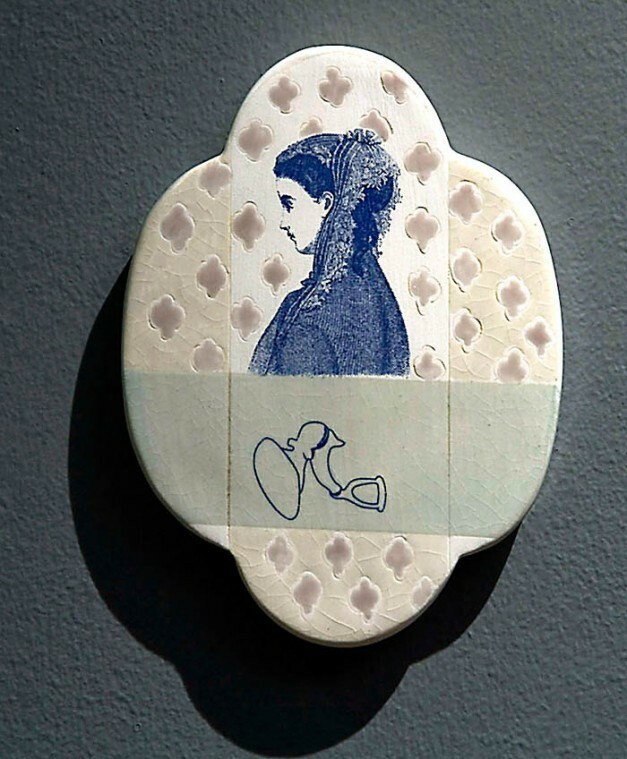 The installation “Wall-Paper” by Aurora Hughes Villa that was displayed in conjunction with the 2012 NCECA in Seattle WA and reviewed in issue 92 of Ceramics Art and Perception, picks up on all these universal themes, but manages to be a work that is intimate and personal. Part of its ease of communication is in the meticulous craftsmanship of each of the pieces. They are created using a mixture of new tech and reliable technique. The vintage wall-paper designs are scanned into Photoshop, where they are manipulated, and then turned into screens for silkscreen, which is applied using colored slips and underglazes. 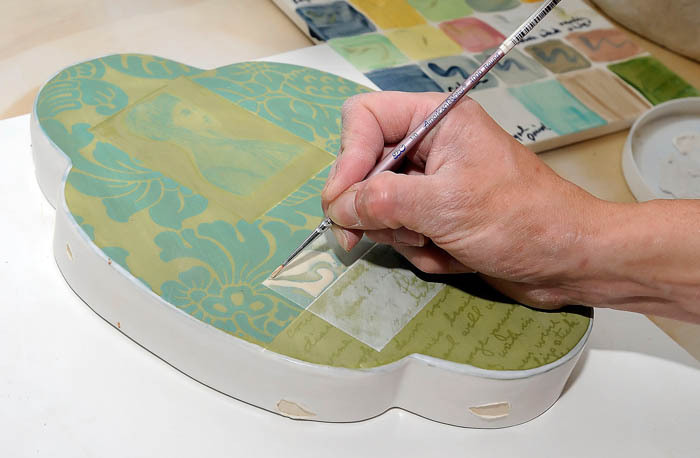 The surface of the clay is formed using a combination of carving, stencils and free painting. The medallions are then fired several times. Each medallion is unique and features cameo images of women, medical drawings of body parts and architectural drawings of Victorian houses. The overall effect of these well placed, well-organized images is controlled and possibly a bit predictable, as is expected of wall-paper, until considering the strong shadows cast on the wall by the heavily top lit medallions onto the dark painted wall. Those shadows blur the edges of the entire piece and break up the uniformity and control. The metaphor for shadow in a calm and ordered environment brings this work out of the Victorian, where the ideals of domesticity created a prison for women, into the contemporary mind, and suddenly the colors are reminiscent of a Martha Stewart Living magazine, also proclaiming the joys of quiet and controlled domestic living. On the opposite wall from the medallions are two strips of wall-paper, tacked up, with the edges loose and bulges by the tacks. These pieces of paper stand in stark contrast to the well placed order on the other side of the room. Hughes Villa is a wife and a mother, and I do not believe she is making a statement that rejects either of those occupations, but rather acknowledges what all wives and mothers sometimes feel in the quest to create well-organized lives.